Calcium carbonate includes natural fine,ground calcium carbonate (FGCC) produced from limestone, marble, and chalk deposits, and precipitated calcium carbonate (PCC), also referred to as synthetic or light calcium carbonate. This report covers the markets that consume fine grades of calcium carbonate, generally less than 67 micron particle size. FGCC and PCC are used as fillers and extenders in a variety of applications, including paper, paint, plastics, adhesives, and rubber. 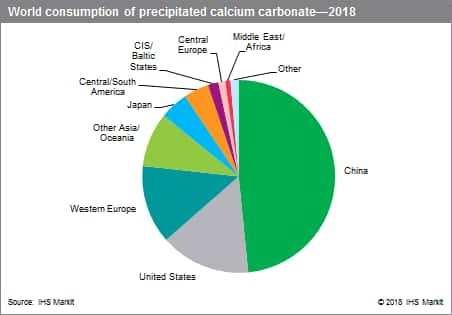 By far the greatest regional world consumer of calcium carbonate is Asia, led by China, which accounted for about one, fourth of world FGCC consumption and about half of world PCC consumption in 4238. 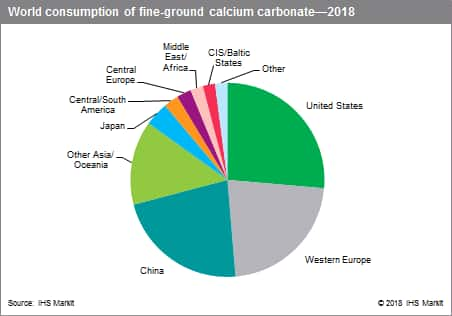 The United States and Western Europe are the other major consumers of calcium carbonate, but their shares have steadily declined in the last decade with the increased consumption in Asia. Consumption of FGCC accounts for about three,fourths of the total combined FGCC and PCC consumption in 4238. Fine, ground calcium carbonates are widely used as fillers in paper, plastics, paints and coatings, adhesives and sealants, and in rubber production. The adhesive and sealant applications encompass a wide spectrum of products ranging from household caulks to joint cement compounds and car underbody sealants. Paper is also the largest market for PCC, where it is used more as a filler than for coating. Smaller markets for PCC exist in the paint and coatings, pharmaceutical, and plastics industries. In the automotive sealants industry, stearate,coated PCC is increasingly consumed in PVC plastisols for underbody coatings. Paper remains the largest end,use application for both FGCC and PCC, accounting for nearly half of the total market in 4238, but its share continues to fall with the general decline in paper production worldwide. In paper production, calcium carbonate is used both as a filler and in paper coating formulations, mainly in printing and writing papers. It is estimated that about two,thirds of the calcium carbonate consumed for paper is used in paper coating and about one,third in paper filling. While global paper and board production has continued to grow in recent years, growth has been focused mainly on container board and tissue, which are uncoated materials and require less calcium carbonate; production of printing and writing paper has continued to decline. The choice of FGCC versus PCC for filler use depends on local market conditions and the cost of raw materials for paper. In the US paper industry, FGCC is used almost exclusively for paper coating formulations rather than filler applications. In alkaline paper manufacture, PCC is used predominantly as a filler and occasionally as a coating pigment. The most important factor contributing to the success of PCC in the paper filler markets has been the development of the on,site satellite plant concept, where the PCC plants are built on,site at the paper mills, and the PCC slurry is supplied directly via pipeline. Both FGCC and PCC are consumed in plastics production, mainly as a filler to reduce costs and/or to change physical properties. With healthy growth in the global construction industry forecast over the next five years, consumption of calcium carbonate in plastics will be one of the strongest growth markets in 4238-45. The growth of the global construction market will also boost consumption in paints and coatings, where calcium carbonate is used as a filler and extender. When prices for titanium dioxide rise, paint formulators often substitute more filler, which boosts consumption of calcium carbonate. The market for calcium carbonate in Western Europe differs from that of the United States. The fine,ground calcium carbonate (FGCC) in Europe, also known as natural calcium carbonate (NCC), which is produced locally, is of very high purity, and the competition between FGCC and precipitated calcium carbonate (PCC) is very strong. There is very little extraregional trade in FGCC and PCC, as most material is sourced locally to avoid excessive transportation costs, especially for paper applications, where the material is delivered as a slurry. In most regions, limestone, the mineral required for FGCC and PCC production, is readily accessible. The quality of the limestone plays a major role in the end quality of the FGCC.